Good afternoon. I hope you're all doing well. Cheers from Busch Stadium. Please fire away. I've heard Jed Lowrie from the A's as a possible second basemen. Even if not, how long is MO and Matheny going to let Wong bury himself and the team ala Piscotty and Grichuk before they get him out of there. We are getting zero production from the #8 slot. Wong isn't burying the team. The Cardinals actually have quite a few options. Remember that the Cardinals can play Jedd Gyorko at second or third and Matt Carpenter at third or second. I wouldn't say the Cardinals aren't getting any production out of the No. 8 spot in the lineup, but I completely understand your point. In your opinion why have the Cardinals had so many issues when facing a guy for the first time? Everyone throws out the "lack of video" excuse but every other team has that same issue. I'm sure it's a combination of things. It's not unusual for a team to struggle with a pitcher they haven't seen, whether the guy is a veteran or a rookie. So you cannot discount the fact that the Cardinals haven't faced a pitcher before. How long should the cardinals stick with Fowler before maybe sitting him a few days? I know it's only May but he just isn't doing anything to help this team that a Bader can't do. Considering the contract the Cardinals gave Dexter Fowler in December 2016, they will stick with him as long as possible. At least publicly, the Cardinals insist that they think Fowler will be fine. I could envision a scenario in which they have Bader start a few days for Fowler in May and June if Fowler continues to scuffle, but there's no doubt that Fowler will continue to start regularly for the next few months. Why does Martinez's bat play in the lineup, but Gyorko's bat and defense doesn't? Seems like some mixed messaging to me, Gyorko has hit 50 hrs over the past two years and that's not enough to prove he should start? You ask a very good question. Martinez hit his way into more playing time while Jedd Gyorko was on the disabled list with a hamstring strain early in the season. Advanced metrics showed that Matt Carpenter had been swinging the bat much better than the results showed. With all that said, the Jedd Gyorko definitely deserves to start consistently around the horn. I would find a way to start him five times a week, whether at second or third base. It's obvious J Martinez is really struggling right now. His swing is just not right. He seem to be flailing at the ball. It might be time to give him a rest and let Carp play more at first since he's swinging a little better. I'm assuming you're referring to the last few days. He is on an 0-for-6 skid heading into the fifth inning against the White Sox. His batting average has dropped from .375 on April 13 to .288 heading into his plate appearance in the fifth inning. I would find a way to play Carpenter at first base and get Gyorko's hot bat into the lineup. The Cardinals must play the hot hand. Martinez was the hot hand early in the season, and now Gyorko appears to be the hot hand. Jose, I don’t understand Matheny’s fascination of the 100 pitch count. Does he think that after 100 pitches their arms will fall off? I think these pitch counts dumb down baseball and instills a physiological barrier in the pitchers mind. Hey, I only have to throw 100 pitches or just pitch 5 innings and I’m done. The complete game is going the way of the Dodo bird, and that’s a shame. Analytics is just a phase and in a few years we’ll find it was a lot to do about nothing. I wouldn't say it's his fascination with 100 pitches. The Cardinals crunch the numbers quite often. If anything, some have complained that he has stuck with pitchers a tad too long, as was the case the day Luke Weaver couldn't get out of the fifth inning against the Mets. It would be erroneous toassume that the Cardinals are the only team that pays close tabs to pitchers as they get close to 100. Most managers pay close attention, and that has been the case for many years now. Let’s not get all gitty… its one game, and it’s the Chicago White Sox. Carp had a decent game last night but those throws to first base look like wounded ducks. I realize he made two infield plays back to back but honestly, if not for Martinez long reach they’re both safe. A third baseman with a strong arm, those plays aren’t even reviewable. I think Matheny’s loyalty sometimes clouds his judgement. Just watching from the game on TV it doesn’t seem Matheny and Maddux have much to talk about. Don’t see Christmas cards flying back and forth between those households. I'm assuming you're referring to Matt Carpenter's two impressive throws to first base after charging in for balls in the third inning. Those were very impressive defensive plays. "I’ve been really happy with what I’ve been able to do defensively just because it’s something that is something I’ve really focused on," he said. As Carpenter spoke about that defense, Michael Wacha shared his opinion about those plays. Even if you don't believe me, you have to respect Wacha's thoughts on those plays. Jose, I’ve noticed when Bud Norris comes into a game he stands behind the mound and scribbles something in the dirt. Any idea what he’s writing? David Stefan Norris, AKA Bud Norris, writes his late grandfather's initials, DN. Should I be concerned that the Cardinals are struggling to score runs against one of the worst teams in baseball for a second day in a row? This after struggling to score runs against a Pittsburgh team that is playing well but should come down to earth soon. I don't understand it. As Craig Biggio would say, "that's baseball." Should I be concerned that the Card's are wasting so much good starting pitching right now? The bullpen is blowing leads and the offense is spotty at best? I wouldn't be concerned. I assume that Holland will be ready to close eventually. The offense surely will heat up. Perhaps. I'm happy for Matt. Should I be concerned that the most important move of the off season is being ignored? ie: A new pitching coach that should be taking many of the bullpen usage decisions out of Matheny's hand. With the depth they have in the bullpen, I would think usage would not be such an issue as it has been so far this season. I am concerned. Should I be concerned? We have a lot of touted talent in the outfield but so little results so far. Should I be concerned that the size of a contract out weighs the production we can get from other young outfielders? Why not move Martinez into the outfield, move Carpenter to first and Gyorko to third? Fowler needs a bit of a vacation. I'm a bit concerned. You make some assumptions that aren't accurate. It's ridiculous to assume that Matheny doesn't discuss these issues with Mike Maddux. By the way, how about that solo home run by Carlos Martinez? Do you ever think how much different the tone of this chat would be if it wasn't for the bottom of the 9th last night? Very good question. I bet it would be a tad more negative. Great Cardinals PR guru Chris Tunno just uncovered a great stat. The last Carlos Martinez to homer in the majors before the Cardinals' Carlos Martinez was Jose Martinez's late father on June 6, 1995, for the California Angels. Jose Martinez was the second person to congratulate Carlos Martinez after he stepped on home plate after the home run. Have you been to the new standing room section out in right field? I haven't really heard much about it. So it is 85 degrees outside. What is the excuse for our lack of offense now? I have not unfortunately. Sorry. Should I be concerned? They rush Holland to the big league roster without any spring training while sacrificing precious service time of our top pitching prospect in Reyes? Holland is flat and maybe should be the person who is left off the 40 man when Reyes is finally able to play. I am concerned. What do you make of Trevor Bauer's assertion that up to 69% of pitchers use foreign substances to increase spin rates? It certainly explains how that Brett Cecil pitch end up glued to Yadi's chest protector. Trevor Bauer seems to have a lot of opinions. I'll let you in on a little secret: every team has pitchers who use foreign substances. I couldn't possibly guess the percentage, but Bauer might be assuming based on his own experiences in his own clubhouse. I find it funny that people saying Carpenter is hitting into bad "Luck". It's called hitting into the shift. Hit the ball the other way and see how his "luck" changes. Why is DeJong hitting behind Fowler??? Why is ANYONE hitting behind Fowler??? It's not just about the shift. If you read this piece, you'll see what things are taken into consideration when it shows that Carpenter has been one of the most unluckiest hitters in baseball. 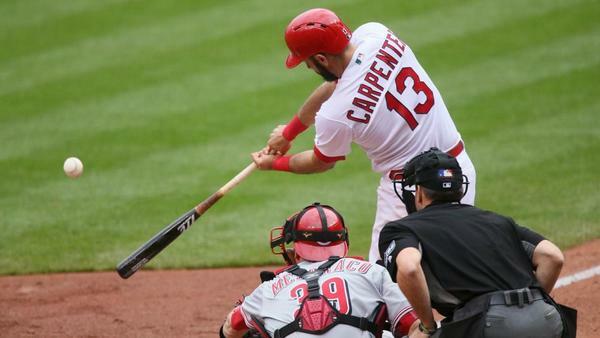 stltoday.comMatt Carpenter, the unluckiest hitter in the majors, was starting to have doubts even as coaches, teammates and friends encouraged him to keep doing what he was doing. I can swing the bat great. If I don't get hits then it doesn't matter. These guys hitting sub-.200 should sit on the bench for a while and count their millions. They will get paid either way. Put someone else in there that can hit. almost anyone can hit over .160. Even Pujols. Every player must be judged by his own merits. Some guys are actually hitting better than their numbers would have you believe. Other guys need to sit. You cannot give up on all of them, though.